While Osprey is located on the water, the only beaches in Osprey are actually private, located on Casey Key. 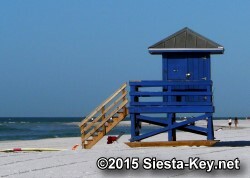 The nearest public beaches are those at the south end of Casey Key in Nokomis, or to the north on Siesta Key. Lifeguards are on duty year round. The lifeguard stands have been painted in primary colors to make it easier to keep track of where you and your children are. The stands are yellow, blue, green and red. Hopefully, it will cut down on problems of lost children. For information on renting picnic shelters call 941-861-5000. Turtle Beach is located on Midnight Pass Road near the south end of Siesta Key. It features a large picnic shelter and is very popular for family outings. In the center of the park is Blind Pass Lagoon which connects to Little Sarasota Bay. Free boat ramps allow easy access to and from the Bay. Although the sand at Turtle Beach isn't as fine as it is farther up the key, it makes up the difference in privacy. Here you'll be able to walk for miles down the beach. Since the closing of Midnight Pass, you can walk all the way down Casey Key. Look carefully in the sand, and you'll find prehistoric petrified sharks teeth that are millions of years old. Although the teeth you'll find on Turtle Beach won't be as nice as what you can find on Venice Beach just a little way south, the example here, shows that a little searching can turn up a nice sample. Palmer Point Beach begins at the southern tip of Siesta Key and continues onto the north end of Casey Key. The northern part of the beach was the former home of Mote Marine Laboratory. Since the closing of Midnight Pass in 1984, the beach allows uninterrupted walking all the way down Casey Key. The beach is a popular spot for boaters and people who walk there from Turtle Beach seeking some privacy. There are no lifeguards and no facilities. Green: All clear or good swimming conditions. Yellow: Use caution for potentially high surf or dangerous currents and undertows. One red flag means that the surf is high or there are dangerous currents, or both. Two red flags or a red flag with a swimmer symbol and white line through it indicate the water is closed to swimming, as conditions are too dangerous for even the strongest swimmers.